When The U.S. Engages, Do Human Rights Improve? : Parallels The U.S. has reached out to foes that include Cuba, Iran and Myanmar. Now the State Department weighs in with its annual report on human rights around the globe. When The U.S. Engages, Do Human Rights Improve? 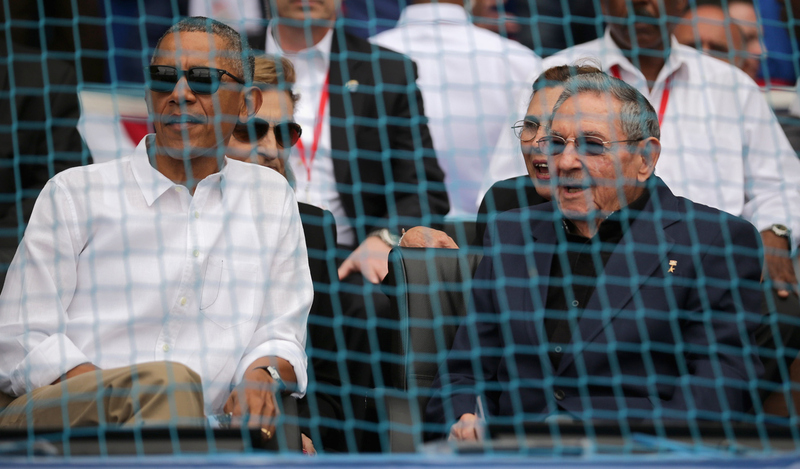 President Obama and Cuban President Raul Castro attend a baseball game during Obama's visit to Havana on March 22. The U.S. has opened up to a number of longtime foes in recent years, including Cuba. This has raised a debate about whether this leads to improved human rights in these countries. The Obama administration has shaken up U.S. policy by reaching out to longtime foes including Cuba, Iran and Myanmar. This has spurred a debate about what impact, if any, the U.S. moves have on human rights in these countries. Some argue that such engagement can encourage authoritarian countries to improve their human rights record, while others say it makes no difference, or may even lead regimes to feel they don't have to worry about punitive measures for rights violations. The U.S. State Department issued its annual human rights report Wednesday, which covers countries around the globe. Here's a look at its findings among those longtime rivals, as well as the status of a some U.S. allies. The report says Cuba started 2015 by releasing 53 political prisoners and opening up to the U.S., though six of those activists were rearrested during the course of the year. "The following additional abuses continued: harsh prison conditions; arbitrary, short-term, politically motivated detentions and arrests; selective prosecution; denial of fair trial; and travel restrictions," the report said, adding that Cuba remains an authoritarian state where the Communist Party is the only legal party. Much of the summary on Cuba's 2015 human rights record was identical to the State Department's 2014 report. Speaking about the report, Secretary of State John Kerry said, "President Obama and I urged the [Cuban] authorities to allow more political openness and online access. There's no question in my mind that most Cubans are far more interested in plugging into the world economy than in recycling arguments left over from the Cold War. The only question is how long it will take for the officials in Havana to catch up to the population." The U.S. and Cuba restored diplomatic relations last July after a break of more than half a century, and President Obama traveled to the island in March, meeting with President Raul Castro. An independent monitoring group in Cuba, the Cuban Commission on Human Rights and Reconciliation, counted 8,616 detentions last year, compared with 8,899 in 2014 and 6,424 in 2013. President Obama's visited Myanmar, also known as Burma, in November 2012 as the country began to make political reforms. Last month, civilian leaders took political power, with Nobel Peace Prize laureate Aung San Suu Kyi becoming the state counselor — which effectively makes her the head of government. More than 100 political prisoners were released last week in a move welcomed by the State Department. "For 25 years, we were struggling alongside them to bring about democratic change, and very few people thought we would make it," said Tom Malinowksi, the assistant secretary of state for democracy, human rights and labor. "If it can happen there, it can happen absolutely anywhere," he added. "So that kind of stuff keeps us going in the face of some of the more depressing news that we are bound to talk to you about in these reports." These recent developments were not included in the State Department's report on 2015, which cited the previous government for continued restrictions on freedom of speech and human rights violations in conflict zones. In addition, the State Department said that last year, Myanmar's government "did little to address the root causes of human rights abuses, statelessness, violence, and discrimination against [the] Rohingya," a Muslim minority. Iran and six world powers, including the U.S., reached a landmark nuclear agreement last July, though the deal did not address the many other points of contention. On the human rights front, the State Department pointed out there are "severe restrictions" in Iran on freedoms of assembly, speech, religion and the press. It also highlighted the "escalating use of capital punishment for crimes that do not meet the threshold of most serious crime or are committed by juvenile offenders." The government also "restricted the operations of and did not cooperate with local or international human rights NGOs investigating alleged violations of human rights." Traditional U.S. allies also came under scrutiny by the State Department, which argues that it sees a free and active civil society as a "bulwark against the spread of violent extremism." The report singles out Egypt for dissolving 500 nongovernmental groups, many linked to the Muslim Brotherhood, and imposing travel bans on human rights defenders and political activists. Turkey is using anti-terrorist laws to "stifle legitimate political discourse and investigative journalism," the report noted.